Today’s drinkers and distillers are changing their minds about rye, that very American booze formerly favored by older gentlemen with barroom tans and smelly sweaters. We recently sampled a great new rye with local provenance; Widow Jane Rye (http://widowjane.com/products/) is made with pure water from a limestone mine in nearby Rosendale, NY and distilled and aged in Brooklyn. 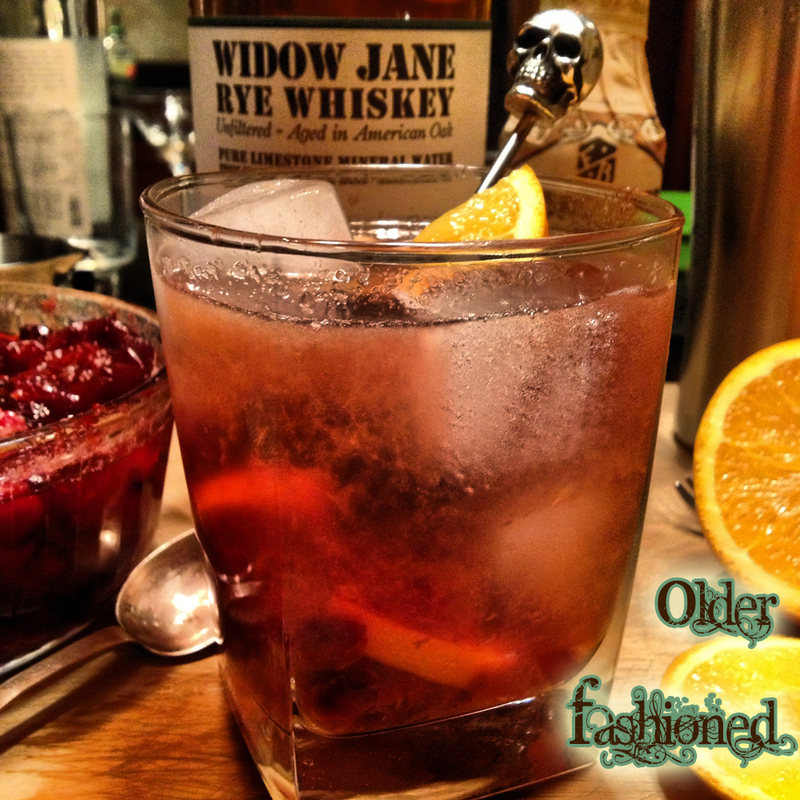 An “Older Fashioned” seemed the best way to enjoy its smooth, dry flavor. We call it an “Older” Fashioned due to the rich and robust flavor derived from the Cranberry and Plum compote which gives an elegant depth to the drink, as opposed to the candy counter sweetness of the standard maraschino cherries. This would be a great cocktail to hand around before or after the Big Holiday Dinner. Cranberries aren’t just for turkey! Muddle an orange slice with a dash or two of Bitters (we used Whiskey Barrel Aged Bitters) and a heaping teaspoon of Cranberry Plum Compote (instructions to follow). Add 3 ounces Widow Jane Rye. Stir, stir, stir. Add your desired number of ice cubes. Stir, stir, stir. Top up with an ounce or so of club soda. Stir, stir, stir. Test for temperature — it should be very cold — and add a swizzle stick. Another pristine piece of orange peel may be used as garnish. Keep stirring over medium heat until the cranberries start popping their skins. Remove from heat and let stand to cool. Store in refrigerator up to 3-5 days.